Mushrooms are considered a kind of fungal reproductive organism. A biologist specializing in mycology is called a mycologist. Mycology branches into the field of phytopathology, the study of plant diseases, and the two disciplines remain closely related because the vast majority of plant pathogens are fungi. Historically, mycology was a branch of botany because, although fungi are evolutionarily more closely related to animals than to plants, this was not recognized until a few decades ago. Pioneer mycologists included Elias Magnus Fries, Christian Hendrik Persoon, Anton de Bary, and Lewis David von Schweinitz. Many fungi produce toxins, antibiotics, and other secondary metabolites. For example, the cosmopolitan (worldwide) genus Fusarium and their toxins associated with fatal outbreaks of alimentary toxic aleukia in humans were extensively studied by Abraham Joffe. Fungi are fundamental for life on earth in their roles as symbionts, e.g. in the form of mycorrhizae, insect symbionts, and lichens. Many fungi are able to break down complex organic biomolecules such as lignin, the more durable component of wood, and pollutants such as xenobiotics, petroleum, and polycyclic aromatic hydrocarbons. By decomposing these molecules, fungi play a critical role in the global carbon cycle. Fungi and other organisms traditionally recognized as fungi, such as oomycetes and myxomycetes (slime molds), often are economically and socially important, as some cause diseases of animals (such as histoplasmosis) as well as plants (such as Dutch elm disease and Rice blast). Apart from pathogenic fungi, many fungal species are very important in controlling the plant diseases caused by different pathogens. For example, species of the filamentous fungal genus Trichoderma considered as one of the most important biological control agents as an alternative to chemical based products for effective crop diseases management. Field meetings to find interesting species of fungi are known as 'forays', after the first such meeting organized by the Woolhope Naturalists' Field Club in 1868 and entitled "A foray among the funguses"[sic]. Some fungi can cause disease in humans and other animals - The study of pathogenic fungi that infect animals is referred to as medical mycology. It is presumed that humans started collecting mushrooms as food in prehistoric times. Mushrooms were first written about in the works of Euripides (480-406 B.C.). The Greek philosopher Theophrastos of Eresos (371-288 B.C.) was perhaps the first to try to systematically classify plants; mushrooms were considered to be plants missing certain organs. It was later Pliny the Elder (23–79 A.D.), who wrote about truffles in his encyclopedia Naturalis historia. 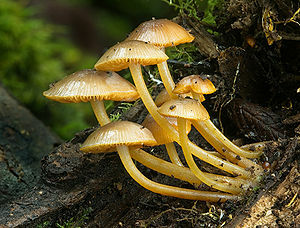 The word mycology comes from the Greek: μύκης (mukēs), meaning "fungus" and the suffix -λογία (-logia), meaning "study". For centuries, certain mushrooms have been documented as a folk medicine in China, Japan, and Russia. Although the use of mushrooms in folk medicine is centered largely on the Asian continent, people in other parts of the world like the Middle East, Poland, and Belarus have been documented using mushrooms for medicinal purposes. Certain mushrooms, especially polypores like lingzhi mushroom were thought to be able to benefit a wide variety of health ailments. Medicinal mushroom research in the United States is currently active, with studies taking place at City of Hope National Medical Center, as well as the Memorial Sloan–Kettering Cancer Center. Current research focuses on mushrooms that may have hypoglycemic activity, anti-cancer activity, anti-pathogenic activity, and immune system-enhancing activity. Recent research has found that the oyster mushroom naturally contains the cholesterol-lowering drug lovastatin, mushrooms produce large amounts of vitamin D when exposed to ultraviolet (UV) light, and that certain fungi may be a future source of taxol. To date, penicillin, lovastatin, ciclosporin, griseofulvin, cephalosporin and psilocybin are the most famous drugs that have been isolated from the fifth kingdom of life. ^ Ruano-Rosa, David; Prieto, Pilar; Rincón, Ana María; Gómez-Rodríguez, María Victoria; Valderrama, Raquel; Barroso, Juan Bautista; Mercado-Blanco, Jesús (2015-11-07). "Fate of Trichoderma harzianum in the olive rhizosphere: time course of the root colonization process and interaction with the fungal pathogen Verticillium dahliae". BioControl. 61 (3): 269–282. doi:10.1007/s10526-015-9706-z. hdl:10261/157852. ISSN 1386-6141. ^ Anon (1868). "A foray among the funguses". Transactions of the Woolhope Naturalists' Field Club. Woolhope Naturalists' Field Club. 1868: 184–192. ^ San-Blas G; Calderone RA (editors). (2008). Pathogenic Fungi. Caister Academic Press. ISBN 978-1-904455-32-5. ^ De stirpium maxime earum quae in Germania nostra nascuntur, usitatis nomenclaturis. Strasbourg. In Ainsworth, p. 13, quoting Buller, AHR. (1915). Micheli and the discovery of reproduction in fungi. Transactions of the royal Society of Canada, series 3 9: 1–25. ^ Smith JE, Rowan NJ, Sullivan R (May 2002). "Medicinal Mushrooms: Their therapeutic properties and current medical usage with special emphasis on cancer treatments". Cancer Research UK. p. 5. Archived from the original on 2009-08-31. ^ Di Rado, Alicia (July 2008). "A salad fixin' with medical benefits?". EHope. 7 (7). ^ Di Rado, Alicia (November 2008). "Can a mushroom help fight lung cancer?". EHope. 7 (11). ^ Deng G, Lin H, Seidman A (September 2009). "A phase I/II trial of a polysaccharide extract from Grifola frondosa (Maitake mushroom) in breast cancer patients: immunological effects". Journal of Cancer Research and Clinical Oncology. 135 (9): 1215–21. doi:10.1007/s00432-009-0562-z. PMC 3751581. PMID 19253021. Geoffrey Clough Ainsworth (1976). Introduction to the History of Mycology. Cambridge University Press. ISBN 978-0-521-21013-3. Fungal Cell Biology Group at University of Edinburgh, UK.